Reflective Neon Green 550 paracord is Neon Green and contains genuine 3M reflective tracer strands (Polyester/Nylon). Made in USA. This Mind Bender 550 Paracord is Neon Green and Black vertical stripes (Nylon/Nylon). Made in USA. This Mind Bender 550 Paracord is Neon Yellow and Black Vertical Stripes (Nylon/Nylon). Made in USA. Hyper Thread 550 Paracord is neon green with orange and blue vertical stripe and spiral pattern (Poly/Nylon). Made in USA. Nerds 550 paracord is Pink and Purple (Nylon/Nylon). Made in USA. This Diamond 550 Paracord is Black with Neon Yellow Diamonds (Nylon/Nylon). Made in USA. Ninja Neon Orange Warrior 550 Paracord is neon orange, black, silver (Nylon/Nylon). Made in USA. Neon Oreo 550 Paracord is white, black and neon green X's (Nylon/Nylon). Made in USA. Surge 550 Paracord is neon yellow with green, neon green and black (Polyester/Nylon). Made in USA. Sushi 550 Paracord is neon orange, green and white with a black X pattern (Polyester/Nylon). Made in USA. Reflective Neon Yellow 550 paracord is Neon Yellow and contains genuine 3M reflective tracer strands (Polyester/Nylon). Made in USA. Checkered Neon Yellow & Dark Maroon 550 Paracord is a Multi colored cord (Polyester/Nylon). Made in USA. Hornet is a 550 Paracord that is black and neon yellow (Polyester/Nylon). Made in USA. Cyber 550 Paracord is blue, neon yellow, neon green, and black with white vertical stripes (Nylon/Nylon). Made in USA. This 550 paracord is neon green in color and contains reflective tracer strands (Polyester/Nylon). Made in USA. This 550 paracord is neon green and contains three glow in the dark tracer strands. Made in USA. Neon Orange with 3 Reflective Tracers 550 Paracord (Nylon/Nylon). Made in USA. Ninja Neon Green Warrior 550 Paracord is neon green, black and grey (Nylon/Nylon). Made in USA. Hyper 550 Paracord is neon green, orange, and purple with black spirals (Nylon/Nylon). Made in USA. Camo 550 Paracord is Neon Pink and Black (Nylon/Nylon). Made in USA. Construction 550 Paracord is black and neon yellow in a spiral pattern (Polyester/Nylon). Made in USA. Ignition, a multicolored paracord made with neon green, orange, and black with black vertical stripes (Polyester/Nylon). Made in USA. Caution 550 Paracord is neon orange and black in a spiral pattern (Polyester/Nylon). Made in USA. Black and Neon Pink Camo 550 Paracord (Nylon/Nylon). Made in USA. Neon Green 550 Paracord (Nylon/Nylon). Made in USA. Recess 550 Paracord is neon green, orange, blue and black (Polyester/Nylon). Made in USA. Island paracord 550 paracord is neon green and white green X's (Polyester/Nylon). Made in USA. Sea Hawk 550 Paracord is neon green and navy with some white (Polyester/Nylon). Made in USA. 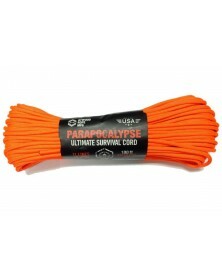 Reflective Neon Orange 550 paracord is neon orange and contains genuine 3M reflective tracer strands (Polyester/Nylon). Made in USA. 550 paracord (Polyester/Nylon) is a neon yellow colored cord with black X's. Made in USA. This Diamonds 550 Paracord Is Black with Neon Green Diamonds (Nylon/Nylon). Made in USA. Name 550 Paracord is neon yellow and acid purple with a little bit of white and black (Nylon/Nylon). Made in USA. Spring Morning 550 Paracord is a bright neon yellow and neon green in a houndstooth pattern (Polyester/Nylon). Made in USA. This 550 paracord is neon yellow with a tiny continuous black X pattern (Polyester/Nylon). Made in USA.